Just in case I don't decide to do the Aran Tree Skirt (and, yes, I bought Handknit Holidays last night! ), I'm still exploring the Kool-Aid dye adventure with all that Lopi, and this color card will be helpful in deciding on colors. Soon, my pretty pile of yarn, you will actually be pretty. One way, or the other. I'll have to try this next time I need a stretchy bind off. Isn't December 20th the time to start Christmas knitting? We've put up the tree and put a store-bought skirt beneath it, which looks OK, but last night I had a brainwave: Why not use some of the undyed Lopi to make a fantastic, cabled 'n' bobbled Christmas Tree Skirt? I'm venturing down the google-hole but have a feeling I may end up heading into uncharted (hehe) territory. Someone on the Knitlist mentioned that there are a couple of skirts in Melanie Falick's Handmade Holidays, including an Aran one, so I'll have to check the book out again at Knit Night tonight. Someone's doing it. Look, how pretty! I did find this at Knitting Pattern Central. Perhaps we need some of those. Peter and I have some nice store-bought stockings friends gave us when we were first married (red and green for me, the little Catholic girl, and blue and purple for him, the nice Jewish boy), but maybe it's time for us to get more personal. I have a stocking at my parents' house that my grandmother made me when I was little, as do my siblings. And Mom needlepointed a stocking for Isobel when she was born; she's working on one for Frances now. But if we're going to spend Christmas in Gloucester, Fisherman's Stockings might be appropriate. Plus, I have all that yarn. Just found some more cuteness! I think Christine's chat about cables on her Pointy Sticks podcast got me in a cable mood. In other Christmas news, I gave my knitted gifts to my family this past weekend (scarves and hats), and Mom got her Clapotis, which I think she really likes. Now, I need to finish Grandma's shawl. I got a fair bit of work done on it between flying to Chicago and being a passenger on the way to and from visiting her. I'm on to the second skein (yay!). It's good, mindless stockinette, but I think I'm getting itchy for a pattern with a little more going on. Time to start Isobel's Christmas sweater (Purple Magic Malabrigo sweater). The first rule of Stash Club: There is no Stash Club. When organizing/assessing your stash, make sure your spouse/SO is somewhere else. Not in the next room watching the game and then wondering where you are. Somewhere else. Or just as your cat/dog/toddler will invariably join you in the loo, your SO will come upon you working on the stash and say "Holy bleep, that's a lot of yarn. Why do you keep buying more?" It's never enough. There is always more. There are so many possibilities out there in the knitting world. Even more if you spin or dye, which I'm sure I'll do eventually.I think we knitters love possibility as much as finished objects. And I think many knitters love the process of knitting. There has been a long-running conversation on the Knitlist about prices for knitted pieces. But I'm sure some knitters sell their knitted items to get them out of the house and make room for more. If knitting is your therapy and you've already made everything you could use yourself, why not make a profit from your therapy? But I plan on some stash reduction come the new year. Or, as I like to think of it, 2007: The Year of Knitting for Meee. I did find a verynearlyalmost FO in the stash. A beautiful little lacy cap from Knitting for Two that just needed the ribbons added, so I did that, and now there's something for my niece in the FO pile. Which is very good, since I seriously sliced my left pinky prepping dinner last night. Ouch! I had to just watch television last night, which made me mopey. Grandma's shawl definitely won't be complete by the weekend. And the SNL we watched was pretty mediocre. What is up with Gwen Stefani?!? And I finished a mitten for DD from the handpaintedyarns Shells yarn before the injury. Just hope there's enough yarn left for the second. If not, I think I'll frog the scarf, since she doesn't seem that interested in it. Or the too small hat, though I was thinking of giving that to DN or a friend's new baby. We'll see. Started a new project from Last-Minute Knitted Gifts last night in some teal-y KSH I got from someone's destashing. Now I understand why people who start knitting with KSH become addicted. It's such yummy yarn that you want to make everything out of it. Well, not really. There are too many yummy yarns in the world to only use one. Washed the Purl scarf for my SIL last night, and the colors are so pretty. I hope she likes it. Now, I have to figure out something else for Mom. The Clapotis is ready for her birthday, but the Purl beret I made for her isn't working, and the cat attacked it while it was drying. I think he chewed through a strand of yarn (or the yarn gave up in one spot during the dinner plate blocking). I think I have to give it up as a lost cause, since the boucle isn't a very rip-friendly yarn. New obsession! I need a hat to go with my garter gloves and purchased another skein of Sheep Number One from Sheep Shop Yarn Company at my LYS. But I don't want to do the same old same old. This is me we're talking about! So, I thought a newsboy cap would be cute. But it is almost impossible to find a knit pattern online. Only crochet. I can only master one craft right now, and it's knitting. So, after much time down the google-hole, I found this, which is pretty cool. I've encountered the Knitting Fiend's pattern generators before, so I'm feeling pretty good about this. I did find another one, but I'm not wild about the pattern stitch. Have you seen Posh Yarn? It looks to die for. I have to stop buying yarn until I complete some more projects. I know, I know, stash enhancement and all that, but I want to knit with the divine goodness I've got! Patience. OK, so I didn''t snap any pics of the FOs, but I did wash and block my garter gloves, which stretched nicely, thankyouverymuch, as well as the Purl scarf for my sister, DH's gloves made last winter, and the purl beret for mom, which will definitely need some fixing. I have a bit of yarn left, so I think I'm going to pick up and knit the cast on edge and decrease some. I guess the yarn is too stretchy or something. I stretched it over a dinner plate for blocking, and there was only about an inch on the underside. Maybe I should rewash and block on a dessert plate or something. I just don't know. I did finish a hat for Dad with yummy blue Malabrigo (azul bolita), I did a double brim, casting on with a bit of lighter blue I had left over from my BFF's little boy's birthday stocking made last year. Then I had enough light blue for one row just before starting the decreases. That yarn is soooo soft, and the color is amazing. That one needs a wash, as well as the asymmetrical cable hat for DH, and my little lovely Purl scarf from last winter. A cable scarf from Blue Sky Alpacas Bulky Hand Dyes is also in the to-wash pile for my brother, but I'm having second (fourth? I've knit something up a few times before I finished this version) thoughts. Maybe it should just be stockinette. It's got two cables on one side and three on the other, but I'm not sure they show up well enough in this darkdark purple. I made it a small tuck scarf, so he could wear it with a dress coat, but I could do that with a plain version, too. I just wanted to do a cable something for him, but maybe that's not this project. I picked up a skein of orangey (glazed carrot? I can't remember right now) Malabrigo and two of purple magic at Seed Stitch in Salem this weekend. There was a plan to put the orange with the blue for Dad, but the orange wasn't intense enough for the blue, so I'm going to make a ribbed hat for DH out of it. No one will mistake him for a deer when he's out with the dog! And the purple magic is for Isobel. I'm going to make her a sweater. The shocking pink one I made her last year is still wearable and oh-so-soft that she needs another (with age-appropriate sleeves). Hope I can whip that one up before the end of the year. More work to do on Grandma's shawl. 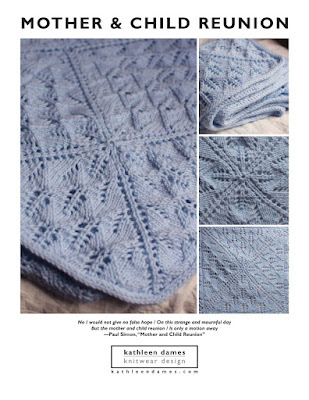 I saw a similar one in the same yarn at Seed Stitch, though they used four skeins, while I only have three. They tubed theirs up, like the one in Alterknits without the fabric inside. It was scrummy. Grandma's will be, too. And I need to make Isobel a pair of mittens from the Shells leftovers. It snowed here this morning (thank goodness I didn't have to direct that photo shoot down in Rhode Island! ), so we need to break out the winter gear. Yes, I did buy more KSH from someone else's destashing. Sigh. Three skeins of caramel color and most of a ball of Trance (beautiful teal blue), as well as a couple of skeins of DB Cashmerino Aran for some Fetchings. Do I need more yarn, probably not. But I can't resist the siren song of Kid Mohair and Silk. I worked on Grandma's shawl last night. It's good mindless knitting for those time when you have to watch ANTM. And Top Chef (tonight's viewing pleasure, thank you, Tivo). The color is scrumptious. I hope she'll enjoy it. So, what shall I make with the new KSH? I think the Haze will have to go towards something like Mrs. Beeton's or maybe the little lacy scarf in Last-Minute Knitted Gifts. Maybe I'll do a Wing of the Moth in the Beige. Although I also have this handpaintedyarn.com black laceweight merino... I think after the holidays I'll be ready to give lace a good crack.